Well hello, fall! Even though it happens year after year, the arrival of autumn is always a little surprising. Almost as if on a switch, one day late in the summer you feel it – a subtle crispness in the air, the trees all of a sudden are a riot of different colors, the air is cooler with a tincture of earthiness – just a hint that brings to mind the cozy evenings and warm, home cooked meals to come. As the coolness takes over the air, our bodies, and taste buds, naturally start craving heartier, more warming foods, and those home cooked meals move toward the warming, autumn harvest foods to satisfy us through the longer, cooler nights. With a transition into a new season, the fresh produce that is available changes as well. As the weather changes across the globe, you will notice a variety of different fresh produce starts to fill the farmers market and local grocery stores. This is a great time to start experimenting and trying new recipes or reworking those old ones to incorporate more seasonal fruits and vegetables. Not only will your taste buds be impressed but there are health benefits too. Here are the many benefits to eating seasonally! It takes a lot of time, energy, and resources to manage, package, and transport foods out of season. This adds to the cost and takes money out of your wallet. When a food is “in season” and abundant, it is less expensive than when it is outside its growing season and harder to find. Save some cash, and shop organic AND local. Check out Local Harvest and Buy Local Food to find farmers and local food near you. Foods grown out of season take a substantial amount of resources in one of two ways: either it takes a lot of extra energy to recreate the natural growing season in an artificial way or it uses a tremendous amount of fossil fuel to transport the foods across the world to you. Seasonal produce can grow without too much added human assistance, pesticides, and GMOs. Large amounts of fuel are needed to transport non-seasonal fruits and vegetables, whereas local, in-season foods do not. This reduces your carbon footprint! Produce that is purchased in season is more likely to be fresher, consumed closer to harvesting which aids in a higher nutritional value! Locally in-season sourced fruits and vegetables will also appear brighter and more vibrant rather than limp and dried up, since the plants get their nourishment from the sun and soil. Seasonally fresh produce is picked when they’re ripe and fully developed, rather than picked before they ripen to sustain the life of the produce as it makes it way to the shelf. Seasonal produce has had more sun exposure, which means it will have higher levels of antioxidants! Fruits and vegetables that are stored for long periods of time due to transportation or to be used at a later date have a reduction in phyto-nutrient content. This is because the early harvesting, transportation, and the time it takes the foods to actually be purchased from the store considerably decreases the nutritional content of the food. Variety is the cornerstone of a healthy diet, and eating seasonally give you that nudge to break food habits and continuously change up your food choices! Instead of eating the same foods and getting the same nutrients over and over again, you switch to new foods as the seasons change. Eating seasonally also forces you to cook more – and there really is nothing better you could do for your health. When you start to take back control of what you put in to your body, you are consciously making better choices for your health and overall well-being. Cooking is also a great activity to show your love to bring your family, friends, and community closer together! It’s really important to note that it’s not always possible to eat locally and seasonally for everyone all of the time. It’s more about the importance of making decisions where possible that are better for you, your wallet and your health where you can! All in all: pay attention to your body and the temperature outside, as the seasons transition, so should your diet. 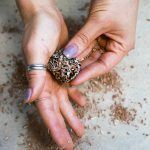 When it gets colder, move from grilling outdoors to roasting/baking in the oven and add in those starchier fruits and veggies as well as hearty grains like buckwheat and oats. 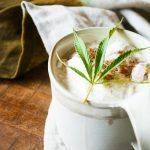 The slow-release complex carbs, paired with our CBD infused spices, can give you sufficient daily cannabinoid levels which in turn helps regulate several bodily functions such as sleep, focus, and allow for lengthier, stronger workouts, less inflammation AND quicker recovery, which is great for training season into the spring! Try out our favorite autumn side dish, or snack that is sweet, filling, and fall produce approved! 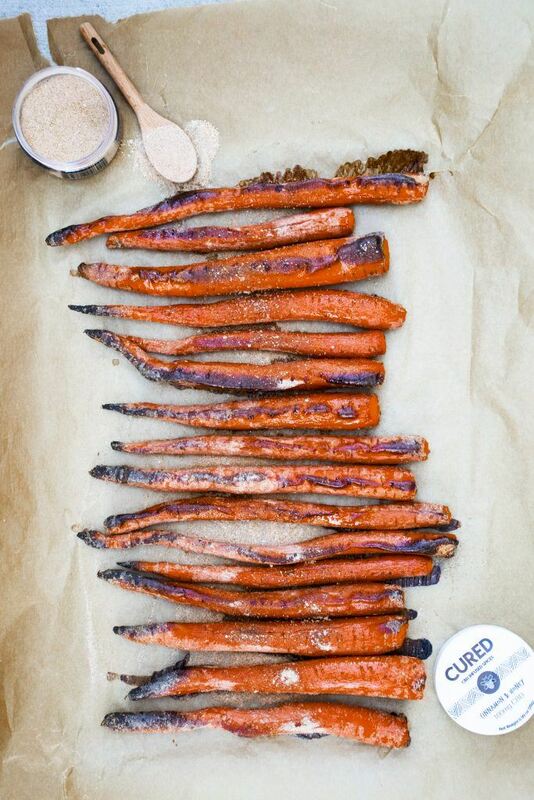 Place carrots on a lined baking sheet. 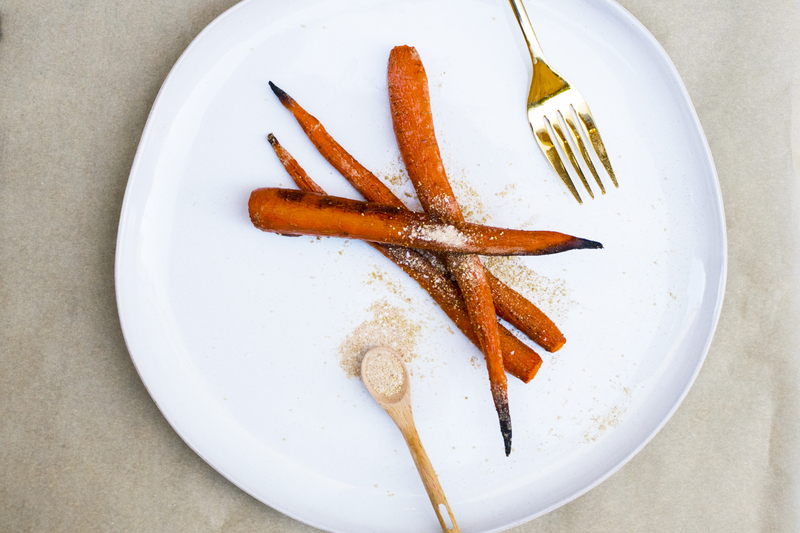 Drizzle coconut oil (melted) onto carrots until they are evenly coated. Add 2 teaspoons of Cured Cinnamon and Honey and Himalayan salt and pepper to taste. Bake for approximately 40-45 mins or until tender. What’s Happening in the World of Wellness? Yumm! Thank you for the recipe! I can’t wait to try it!